I was inspired to create a spring surprise gift for a friend. with a monochrome colour scheme but many structures and textures. on which the rabbit sits. with a sharp cutter knife into two parts. Then I browsed my stash for some remnants of leftover MDF parts. The semicircle fitted very well under the shelf as additional stabilisation. which makes the whole thing seem much more alive and dimensional. 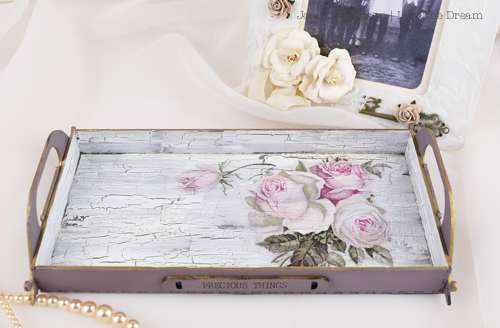 It is perfect for placing some light decorative items on it. or perhaps still in the snow?! Hello and welcome to another of my "useful" makes! Today I am using a printer tray and some rather swish Art Deco ornament shapes which I thought looked like handles! I really love the fact that so much of the wonderful MDF pieces at Calico Craft Parts can be utilised in so many different ways. 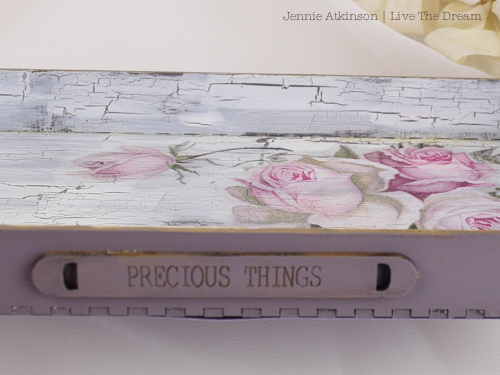 I started with the inside of the printers tray giving it a crackle finish using DecoArt Weathered Wood over acrylic paint. I was then able to layer a lovely napkin over of the top and the crackle still shows through. I then glued the tray together and painted the outide in the same acrylic paint adding a Word Element onto the front of the tray. I always edge everything in gold metallic paint to try and give it a shabby feel. However my hand is not that steady these days and so I am always going over the edge! And then the Art Deco Ornament "handles" were painted lightly to retain the etched pattern and stuck onto the sides of the tray. Somewhere to keep all my little bits and pieces of jewellery on the dressing table - so useful !! I also plan to make another tray for the sitting room table to hold some small candles and artifical flowers. There are quite a number of different Art Deco Ornaments which can be used as "handles" - so plenty of choice! As always thank you for joining me today and happy crafting! Hi everyone, Lesley here, with an upcycled project. I had a piece of wood lying about which was crying out to be decorated. Lots of layers were used to create this piece. I painted it a cream colour to begin with, then added a layer of crackle, and blue over the top. I then added bits of torn printed tissue paper, and a few bits of washi tape. I then stamped some numbers over the top. The ATC frame was coloured with bronze wax, and I added some embroidery floss before gluing down the girl. The scrolls were from a previous project which I had snipped off. These were coloured with the same wax and some embossing enamels. I snipped off some of the roses and embossed them before adding to the piece. Finally, I added some wording from my stash and flicked some black and white ink over the entire piece. Hello and Welcome to Calico Craft Parts blog, where it's my turn to play. As you may know I love to make art dolls. It's such fun to gather some pieces that suggest a character to you and then set your imagination to work. I've recently been teaching an on line class where we've been creating Art Dolls and many of the class have discovered that this is a great form of self expression and a wonderful way of telling their story. Calico have a versatile range of Art Doll Kits, which can be mixed and matched - not only with each other, but with all kinds of other Craft Parts - to create unique dolls. This week, though it's 'Curtain Up' on a little Pierrot I created from a tag and an egg shape with some exquisite little Craft Parts to evoke a mood. The oval of the head suggested a Pierrot with his chalky face tilted downwards very much like a pose I had been working on in a portrait class. Once I'd gesso'd the pieces, I had decided - this was definitely going to be a Pierrot doll. I tend to start with the Art Doll's face and the character evolves from there. For my Pierrot, the white Gesso was the perfect clown's foundation make-up and I just had to add features in pencil, going over them with a fine black marker and adding a hint of colour with some water-colour pencils. Water-colour pencils over gesso were great for adding layers of translucent drapes and folds of Pierrot's costume. To convey the tender nature of this doll, I added just 3 embellishments: a simple heart, a delicate wild rose blossom and a little wren. The finishing touches are some gilding, a white brad on the chin, so the head can be inclined and a swirl or 2 of blue glitter on the pom-poms. Since first seeing images of the 'Sad Clown' in my childhood, Pierrot has intrigued me. I was - like many children - disturbed and scared by traditional circus clowns but Pierrot enchanted me with his melancholy white face and diaphanous costume. We still recognize this sad, unrequited lover, spurned by the beautiful Columbine who chooses Harlequin as her beau. His image goes in and out of fashion but he never disappears completely despite having first taken to the stage way back in the seventeenth century! Perhaps it is his innocence and that he has come to symbolise the lonely artist, rejected by the world but still in love with its beauty that has appealed to so many from Picasso to David Bowie. Thank you so much for stopping by and taking a look at my little Pierrot today. Happy Creating until we meet again in a fortnight. Today a new inspiration project. and are out with him on the road more often. 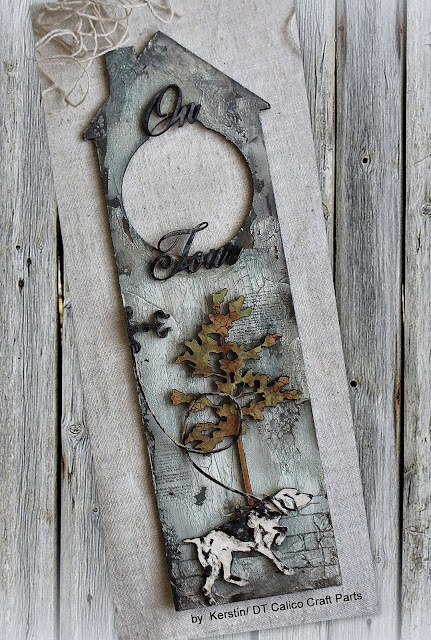 from DecoArt (Dark Grey, Medium Grey and Dark Patina). In the lower area some brickwork was stamped. A spotted dog painted with white, grey and black acrylic colours. Servus, hi and thanks for stopping by! Claudia here again with a new steampunk project today. You know my obsession for notebooks and journals, don't you? So when I found out that the absolutely amazing "Steampunk Clockworks Motif Style 23" at size "Large" perfectly fits the cover of the Eileen Hull "Passport" book die, that was absolute steampunk heaven for me! And with the use of some of my favourite go-to DecoArt paints and media it was - as usual - great fun to put all these parts together to create a stunning steampunk journal cover! I love to use the steampunk gears, cogs, washers, screw heads and other bits from the Mini MDF Sheets as these are perfect to add dimension by creating "mechanical layers" as I like to call them. As usual I took a picture of the arranged pieces all put in place (for my own reference mainly). I also made a picture of the whole arrangement taken apart, so you can spot all the small wood shapes I have added. I love how complex and beautiful the base shape already is! And the laser engraved details even make painting this wood shape a lot easier! I started with loosely applying DecoArt premium Warm Grey acrylic paint with a worn bristle brush to the covers and the large base steampunk clockwork panel. I made sure that areas of the original substrate remained untreated here and there! I also only used vertical brushstrokes to create a pattern that would visually bind all the pieces together. The smaller wood shapes were treated the same way. I had also used the different sides of the grey board for the two covers. Grey board usually has a smoother side and one that is rougher. So the different texture will lead to different results from the same painting techniques! I have taken a picture of both covers side by side so you can spot the difference yourself. I used the "smoother" cover for the back cover as the wood shape there is a lot smaller - so it needs a less textured background to be still well visible. 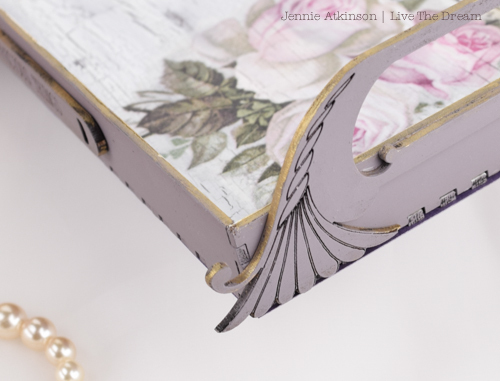 The outside of the journal's spine was painted in DecoArt premium Burnt Umber acrylic paint and put to the side. Then I glued all the pieces in place using DecoArt matte Decou-Page. Once that had dried, I loaded a soft brush with slightly diluted DecoArt premium Quinacridone Gold Hue and added some sprinkles to the covers. I also used the Quinacridone Gold Hue to paint some of the cogs and gears, label holder and screw heads (using a fine detail brush). I knew I would paint over some of these again but it is always a good starting point when you have "nailed" the shapes and areas where you need darker colours to make your design more interesting and to add tension to your composition. Then I went in with my detail brush and DecoArt Dazzling Metallics "Venetian Gold" and Matte Metallics "Aged Bronze" and "Pewter". The result looked quite bright and colourful and way too neat, but I was going to tone that down anyway by adding DecoArt premium Carbon Black acrylic paint on top using the dry brushing technique. To add that final metal bling and also evoke the idea of old, dull metal being "polished" here and there by daily usage of the journal (which means a lot of touching, carrying, putting it in and out of a travel bag...), I used DecoArt "Gold Rush" Metallic Lustre to finish off my journal covers. The covers' and the spine's edges were also highlighted with Gold Rush, that I simply applied with my fingertip. I still had some left over "Venetian Gold" paint on my palette, so I sprinkled that onto the covers as well. The same was done with watered down left overs of Carbon Black. I used more matte Decou-Page to assemble the journal. I like to use bought note books instead of die cutting my own signatures. Gladly I managed to find some of perfectly matching size! Yay! So all I needed to do was poke holes in the according spots, thread through some brown waxed cotton string from outside to inside and tie the ends into a knot. I hope you have enjoyed your visit and are inspired to browse the wide range of fabulous steampunk wood shapes in the Calico Craft Parts store to find your favourite pieces to put on your own steampunk journal covers! 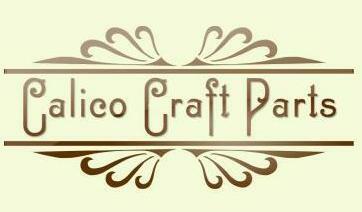 Copyright Calico Craft Parts - All Rights Reserved. Simple theme. Powered by Blogger.